Therapy-related myeloid neoplasms (t-MN) are defined by the World Health Organization (WHO) as clonal hematopoietic stem cell disorders related to previous exposure to chemotherapy and/or radiation therapy. The therapy-related myeloid neoplasms (t-MN) category represents a heterogeneous group of myeloid neoplasms that share diagnostic features of conventionally defined myeloid malignancies, including myelodysplastic syndromes (MDS), acute myeloid leukemia (AML), and myelodysplastic/myeloproliferative neoplasms (MDS/MPN). 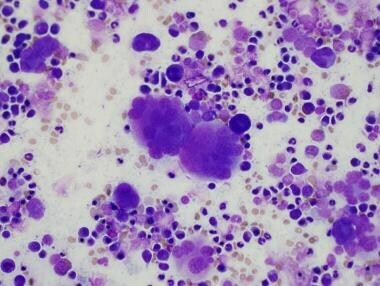 However, the therapy-related neoplasms progress quickly regardless of their morphologic appearance at presentation and are considered to be a single diagnostic entity. On the basis of clinical behavior and morphologic features, 2 groups of therapy-related myeloid neoplasms (t-MN) have been defined; these 2 groups are distinguished principally on the basis of the nature of cytotoxic therapy. Cases of therapy-related myeloid neoplasms (t-MN) that arise following therapy with alkylating agents (eg, cyclophosphamide, chlorambucil, cisplatin) and/or ionizing radiation have a relatively long latency period (5-10 y) after primary exposure. 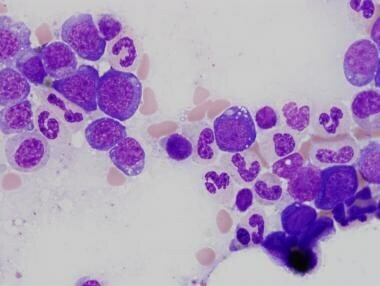 On bone marrow aspiration, the morphologic features are those of myelodysplasia. Patients who are exposed to topoisomerase II inhibitors (eg, etoposide, doxorubicin) tend to present with frank leukemia within 1 year of the time primary therapy was initiated (see the following image). 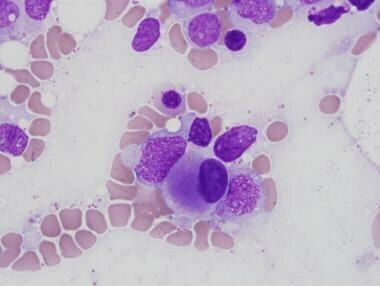 Acute myeloid leukemia from a patient who presented 10 months after therapy with topoisomerase II inhibitor. See also Pathology of Acute Myeloid Leukemia With Myelodysplasia-Related Features, Pathology of Other Myeloid Related Precursor Neoplasms, and Pathology of Acute Myeloid Leukemia Not Otherwise Categorized. The clinical presentation of therapy-related myeloid neoplasms (t-MN) is largely dependent on the nature of the antecedent therapeutic regimen. Patients treated with alkylating agents and/or radiation therapy typically present 5-10 years after exposure; the latency period for patients treated with topoisomerase inhibitors is on the order of 1-5 years. Despite the archetypal and often distinguishing morphologic features of these 2 groups, the clinical presentations are nonspecific and are related to the degree of bone marrow failure (see Morphologic Features). Clinical features are generally related to the corresponding cytopenia (eg, bleeding with thrombocytopenia; fatigue and exercise intolerance with anemia; fever and infection with neutropenia). Most commonly, the morphologic features of alkylating agent/radiotherapy–related therapy-related myeloid neoplasms (t-MN) are those of myelodysplasia, in particular, refractory cytopenia with multilineage dysplasia (RCMD). Evaluation of the peripheral blood smear demonstrates 1 or more cytopenias, often including a macrocytic anemia. Platelets may show nonspecific variation in size; giant forms may be present. Dysplasia of the granulocyte lineage may be assessed on the peripheral blood smear; hypolobated nuclei and hypogranularity are common features. The bone marrow is most frequently normocellular to hypercellular with a variable blast percentage. 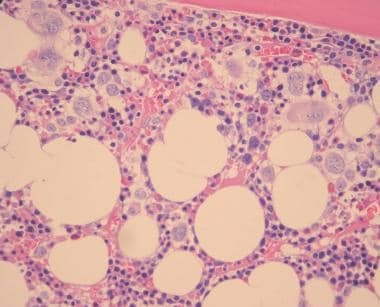 The erythroid series may show the full breadth of dysplasia, including nuclear and cytoplasmic atypia (see the first image below), as well as megaloblastoid features. Ring sideroblasts are often present and may be identified with iron stains (eg, Prussian blue) (see the second image below). Nucleated erythroid precursors with cytoplasmic vacuolization. Megakaryocyte dysplasia is manifest as hypolobate or hyperlobate forms, megakaryocytes with nuclear segregation (see the first image below), and/or microcytic forms with abnormal paratrabecular localization and clustering (see the second and third images below). 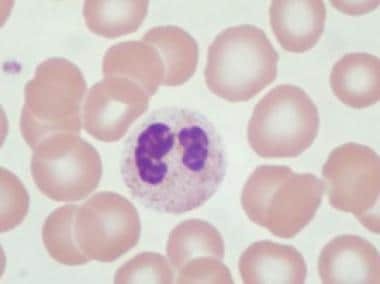 As with peripheral blood, the bone marrow granulocyte lineage may show variation and abnormalities of granulation and nuclear hypolobation of the mature forms (ie, pseudo–Pelger-Huet anomaly) (see the fourth image below). Abnormal megakaryocytes with segregated nuclei. Bone marrow biopsy specimen showing erythroid hyperplasia and clusters of abnormal megakaryocytes. 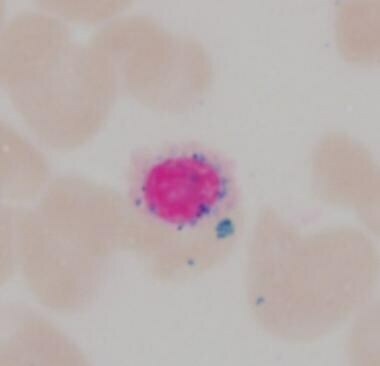 Pseudo–Pelger-Huet cell: granulocyte with bilobed nucleus attached by thin band of chromatin/nuclear membrane. Immunophenotypic studies are not used to distinguish therapy-related myeloid neoplasms (t-MN) from de novo cases of myeloid neoplasms but rather to clarify abnormal populations. The myeloblasts are characteristically CD34-positive; their distribution and burden may be demonstrated with CD34 immunohistochemical studies. Therapeutic advances have dramatically influenced the clinical course of numerous malignant, reactive, and autoimmune disorders. However, the therapies themselves can be mutagenic. Cytogenetic abnormalities are present in the majority of cases of therapy-related myeloid neoplasms (t-MN) and are related to the therapeutic regimen. [4, 5] Conventional cytogenetic analysis (ie, karyotype) and fluorescence in situ hybridization (FISH) studies for specific abnormalities may be helpful in the diagnosis and prognostication of disease. Vardiman JW, Arber DA, Brunning RD, et al. World Health Organization Classification of Tumours of Haematopoietic and Lymphoid Tissue. Swerdlow SH, Campo E, Harris NL, et al, eds. Vardiman JW, Arber DA, Brunning RD, et al. 4th ed. Lyon, France: IARC Press; 2008. chapter 6. Leone G, Pagano L, Ben-Yehuda D, Voso MT. Therapy-related leukemia and myelodysplasia: susceptibility and incidence. Haematologica. 2007 Oct. 92(10):1389-98. [Medline]. Leone G, Mele L, Pulsoni A, Equitani F, Pagano L. The incidence of secondary leukemias. Haematologica. 1999 Oct. 84(10):937-45. [Medline]. Mauritzson N, Albin M, Rylander L, et al. Pooled analysis of clinical and cytogenetic features in treatment-related and de novo adult acute myeloid leukemia and myelodysplastic syndromes based on a consecutive series of 761 patients analyzed 1976-1993 and on 5098 unselected cases reported in the literature 1974-2001. Leukemia. 2002 Dec. 16(12):2366-78. [Medline]. Smith SM, Le Beau MM, Huo D, et al. Clinical-cytogenetic associations in 306 patients with therapy-related myelodysplasia and myeloid leukemia: the University of Chicago series. Blood. 2003 Jul 1. 102(1):43-52. [Medline]. Rund D, Krichevsky S, Bar-Cohen S, et al. Therapy-related leukemia: clinical characteristics and analysis of new molecular risk factors in 96 adult patients. Leukemia. 2005 Nov. 19(11):1919-28. [Medline]. Pedersen-Bjergaard J, Andersen MK, Andersen MT, Christiansen DH. Genetics of therapy-related myelodysplasia and acute myeloid leukemia. Leukemia. 2008 Feb. 22(2):240-8. [Medline]. Ishizawa S, Slovak ML, Popplewell L, et al. High frequency of pro-B acute lymphoblastic leukemia in adults with secondary leukemia with 11q23 abnormalities. Leukemia. 2003 Jun. 17(6):1091-5. [Medline]. Singh ZN, Huo D, Anastasi J, et al. Therapy-related myelodysplastic syndrome: morphologic subclassification may not be clinically relevant. Am J Clin Pathol. 2007 Feb. 127(2):197-205. [Medline]. Wood BL. Myeloid malignancies: myelodysplastic syndromes, myeloproliferative disorders, and acute myeloid leukemia. Clin Lab Med. 2007 Sep. 27(3):551-75, vii. [Medline]. Godley LA, Larson RA. Therapy-related myeloid leukemia. Semin Oncol. 2008 Aug. 35(4):418-29. [Medline]. [Full Text]. Schoch C, Kern W, Schnittger S, Hiddemann W, Haferlach T. Karyotype is an independent prognostic parameter in therapy-related acute myeloid leukemia (t-AML): an analysis of 93 patients with t-AML in comparison to 1091 patients with de novo AML. Leukemia. 2004 Jan. 18(1):120-5. [Medline]. Michels SD, McKenna RW, Arthur DC, Brunning RD. 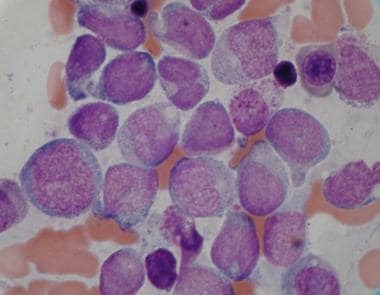 Therapy-related acute myeloid leukemia and myelodysplastic syndrome: a clinical and morphologic study of 65 cases. Blood. 1985 Jun. 65(6):1364-72. [Medline]. Gustafson SA, Lin P, Chen SS, et al. Therapy-related acute myeloid leukemia with t(8;21) (q22;q22) shares many features with de novo acute myeloid leukemia with t(8;21)(q22;q22) but does not have a favorable outcome. Am J Clin Pathol. 2009 May. 131(5):647-55. [Medline].